If you are looking for brilliant yellow flowers for a shady position then Stylophorum diphyllum, commonly called the Celandine Poppy, is one to consider. This is a brilliant little plant to grow beneath a deciduous tree. The bright yellow flowers give a shaded area a real lift. The foliage lasts well through summer and the plant itself is very easy care. Although tylophorum diphyllum will naturalise, it is not an invasive plant and does not crowd out or smother other small spring ephemerals that grow in the same conditions. Ours has been happy in the garden for over 10 years and has hardly spread at all. It has self seeded, however only a little, and it is easy yo remove by hand, and again we have not need to do this. We grow this useful little plant alongside Uvularia grandiflora, Astilbe, Trilliums and Dicentra. Once established this is a very low care plant. Dig in a little well rotted manure and compost before planting. Water well through the first summer. Mulch around the plant after it appears in spring. Deadhead if you want to prevent self seeding. Botanical Name – Stylophorum diphyllum. Common Name – Celandine Poppy. Origins – USA, Eastern States. 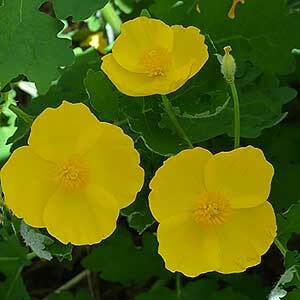 Flower Colour – Yellow and Poppy like. Foliage – Mid Green and Oak like in shape. Garden Styles – Woodland borders, Cottage Gardens, Beneath deciduous trees. Propagation – From seeds or by division. This is not a plant that is readily available for sale. You may find seeds for sale online.